It's official! Winter has arrived! Crisp snow is on the ground. A brisk, cold breeze is around every corner. Winter birds are looking for food. Left to right: Trail from Signal Point to Point Lookout. Council Point looking North. (Below) Bluff looking towards Iowa. Road from Wisconsin Ridge Campgrounds. If you have the right equipment and warm clothes, Winter is a great time for camping. There are no crowds and no bugs, and there's plenty to do—cross-country skiing, snowshoeing, snowmobiling, animal tracking, bird watching, and ice fishing. Winter campers will find quiet, solitude, and clear views through leafless woods. Wyalusing State Park has 55 sites, 6 of them plowed. Electrical hookups and water are available*. 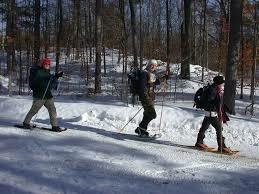 Wyalusing State Park has 6.9 miles of mapped cross-country ski trails. The Mississippi Ridge Trail is bound to be the easiest ski with the greatest view. The trail runs through a hardwood forest. The most challenging part is a five foot dip into a little ravine. The trail skirts tall maples paralleling Cathedral Tree Drive. The drive is unplowed. The overviews are as spectacular as the trail is tame. The southern end of the trail is at Henneger Point. Pack in a picnic lunch. Eat at the shelter and enjoy the panoramic view of the Mighty Mississippi River. Leave nothing behind other than ski tracks and foot prints. The road to Homestead campground and Homestead picnic area is closed for the Winter season. Whitetail Meadows may be the only groomed trail this year at Wyalusing State Park. The trail is located between the Park office and the Observatory. It is located along open fields and follows some woods. 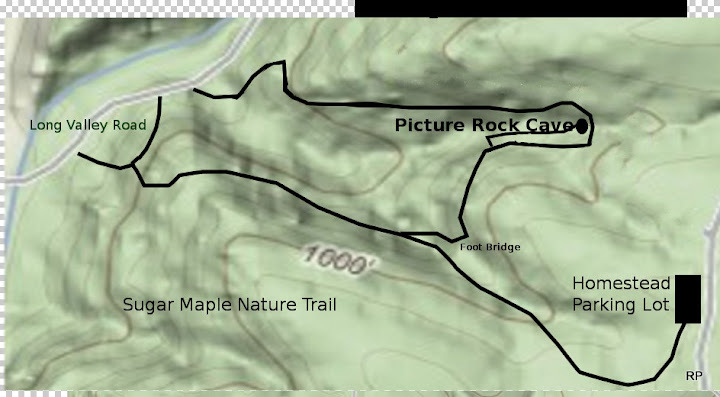 The map(above) shows intersections which can be used to shorten the 2.6 mile trail. The Sugar Maple Trail is your ticket to a wonder of winter. Sugar Maple Trail invites users to e xplore 1.5 miles all seasons of the year. Both hikers and snowshoers enjoy conquering the steep slopes and the series of steps found along this heavily wooded, self-guided nature trail. Interpretive signage along the path identifies various plants and states ecological principles. Deep in the recesses of a narrow niche in Wyalusing’s 500-foot-high bluffs lies Pictured Rock Cave. In winter the sheltering dolomite overhang holds a beautiful frozen waterfall from rim to floor. Access to Sugar Maple trail may be a little daunting. Homestead drive isn’t being plowed. Therefore, parking access to Homestead parking area isn’t accessible. Long Drive (the road to the boat docks) is being plowed. The closest access to Sugar Maple trail is at the boat dock parking lot. Stop in at the park office and ask about road conditions. While you are at the office, ask about Friends of Wyalusing shirts and sweatshirts. They make wonderful Christmas presents. *The Friends of Wisconsin State Parks 2008 Calendar can now be purchased on-line. The calendar includes 12 photos taken in state parks throughout Wisconsin, details on activities at these parks, and monthly events held around the state. 100% of the calendar proceeds go to FWSP to aid local groups in protecting, preserving, and improving the State Park System! 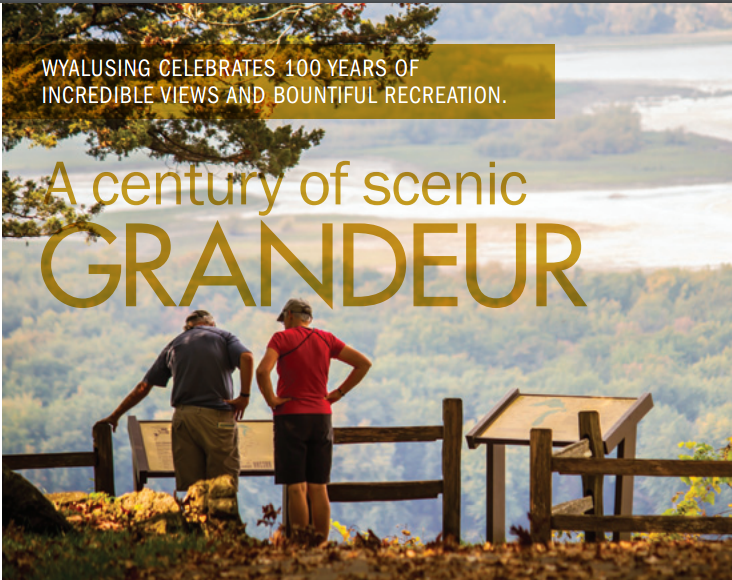 A Park Sticker and 2009 State Park Calendar will make a great gift for any Wisconsinite! For holiday orders, all orders placed by Thursday, December 18, will be shipped by Friday, December 19.